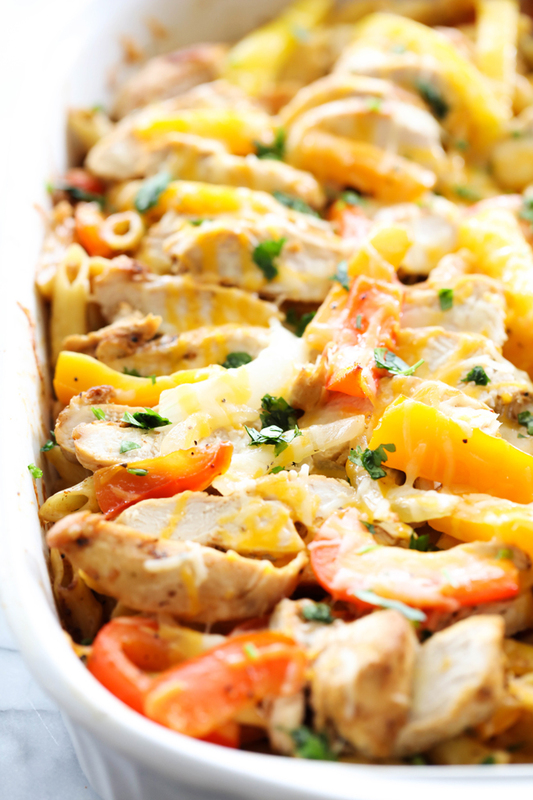 This Chicken Fajita Pasta Casserole is easy and loaded with delicious flavor and yummy ingredients. It is a great meal for any night of the week! Life is getting into a busy mode again. I entered second trimester a few weeks ago and am patiently waiting for my energy to come back. I am still so tired and because of that, dinner needs to be easy. I am always trying and creating new casseroles for dinner. They are my FAVORITE way to enjoy dinner. They are easy to assemble and everyone loves them! 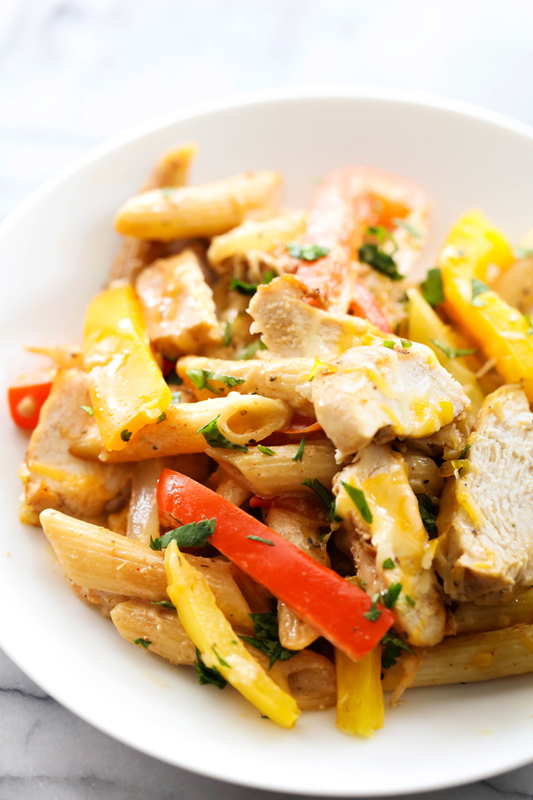 This Chicken Fajita Pasta Casserole is a fun spin involving different flavors and ingredients that aren’t normally paired together. Its bold in both in flavor and textures. In a large skillet, heat oil to medium high and add chicken. Sprinkle a portion of the seasoning mix on the chicken to lightly coat the chicken. Cook for 3 minutes. Flip the chicken and then sprinkle more of the seasoning mix over the chicken and cook 3 more minutes. Turn the heat down to medium low and cover chicken and cook additonal 8 minutes or until chicken is done and completely cooked through. Remove from skillet and slice chicken in lengthwise strips. Set aside. Sauté veggies in large skillet in 3 Tablespoons olive oil. Cook for 3 minutes. Add cream and the remaining seasoning mix from the chicken and also the other package. Spray 9x13 baking dish with vegetable spray. Place pasta in baking dish and add veggies with cream. Stir in 1 cup of the mexican cheese blend. Place chicken over the top. Add the remaining cheese over the top of the casserole. Return to the oven for 5 more minutes. Hi! I came to say that I tried your recipe yesterday and it was a success. My mother-in-law even asked me to teach it to her! hahaha Thank you so much!